How To Eradicate Wasted Spend Using Adwords Negative Keywords | Clicteq | PPC Agency London, Humans, I don't see any? If you are looking for an effective way to combat the rising cost per conversions and irradiate any wasted spend from your PPC account then using Adwords negative keywords are a great way to do this. A lot of advertisers dedicate a huge amount of time to building substantial keyword lists of 10s or even 100s of thousands of keywords, but they don’t devote the same amount of time to creating a comprehensive negative keyword list to weed out irrelevant searchers or poor performing search terms. For the beginners out there that may be wondering what are negative keywords? In simple terms they allow you to block your ads appearing for searchers containing your negative keyword. So for example if you have the negative keyword “Adwords” then your ads would not appear for any searches contain the keyword “Adwords” such as “Adwords management London”. In this guide I’m going to be explaining the different negative keyword match types, how you should apply negative keywords and 10 effective strategies for finding new negative keywords for your account. Like keywords within your account, negative keywords also have a match type that determines which searches they will stop your ads appearing for. They are very similar to keyword match types, however there are some subtle changes that I will be covering in this section. Negative exact match keyword work exactly the same as exact match keywords. It will only block your ads from appearing if the search that the user typed into Google matches your negative keyword exactly. So for example if you had the negative keyword PPC management then this would only stop your ads from being displayed to users that type PPC management exactly into the search box. Negative phrase match keywords will block your ads from appearing for any search that contains the negative keyword. Let me give you an example. So say you have the phrase match negative keyword “ppc management” then your ads will not appear when a user searchers for PPC management in York because it contains the words ppc management. Finally negative broad match keywords will block your ads from appearing for any search that contains the negative keyword in any order. So for example say you had the broad match negative keyword PPC Service then this would block your ads from appearing for the search PPC management for service based companies. Here even though the words ppc and service are not together it will still block your ads from appearing for this search. 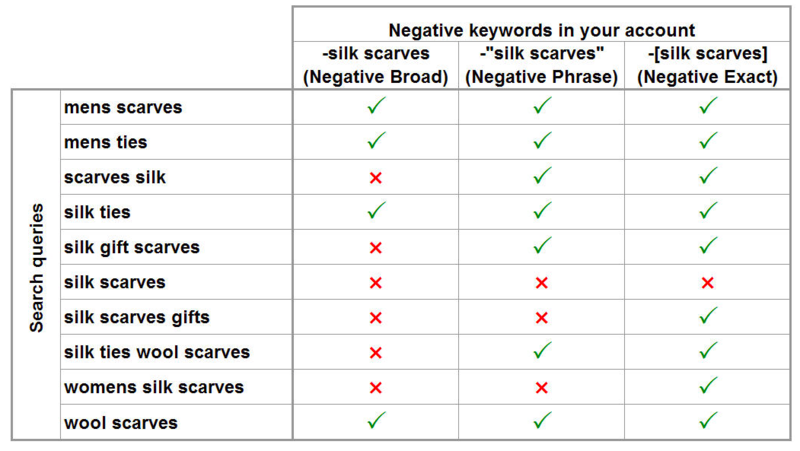 To help you further Google has put together a chart that gives examples of which searches your ads would be blocked from appearing for by adding silk scarves in the three different negative match types. A tick indicates when your ad would be shown and a cross indicates when your ads would be blocked from being shown by the negative keyword. If you want to block all of the searches around a specific keyword the using single broad match keywords are the best way to do this. For example say you see the search term PPC management Jobs but your running a campaign to generate enquires for our PPC management services. You only want people that are interested in our PPC services and want to stop ads appearing to job seekers. If you added the exact match negative keyword [PPC management jobs] then you would only block your ads from appearing when a user types into Google PPC management jobs. But then our ads would still appear when somebody searched PPC management jobs in York. However this is another search that we would not want our ads to be displayed for. We want to stop our ad appearing whenever somebody types in the word job. The solution is to add Jobs as a broad match negative keyword. This will block your ads from appearing for any search containing the word job. So now your negative keyword would stop our ads appearing for PPC management jobs in York and any other search that contained the keyword Jobs. Understanding What Level Adwords Negative Keywords Should Be Added. To be used effectively to reduce wasted spend or for other strategies such as separating your match types by campaign then you need to add your negative keywords at the right level. 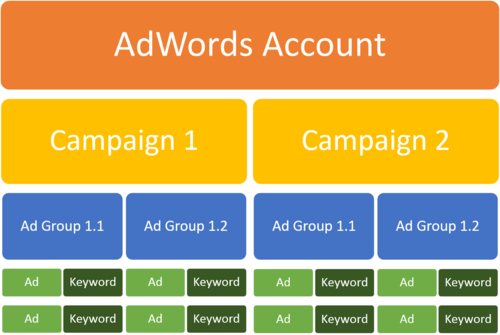 At this point you might be wondering what i mean by level, well this can be explained using this diagram that shows the average Adwords account structure. If a negative keyword is added at account level it will block all of the adverts in your account from being shown for that keyword. If it is added at campaign level it will only block your ads within that campaign from being shown for that negative keyword, but adverts in other campings will still be eligible to show for that keyword. Finally if the negative keyword is added at ad group level then only adverts in that ad group will be blocked for showing for that keyword. All of the ads in your other ad groups will be eligible to be shown. So how should you choose which level you should add your negative keywords? By default Adwords negative keywords are generally added at campaign level. If the negative keyword would be relevant to several different campaigns then it should be added at account level using shared negative keyword lists. If the negative keyword is only relevant to a specific ad group then it should be added at ad group level. A classic example of this would be where you have several copies of the same campaign targeting different locations. For example if you are managing an account for a client selling boilers. If you add the broad match negative keyword Bosh boilers for the campaign targeting Oxfordshire because the company does not sell this model of boiler. Then the same negative keyword would apply to the campaign targeting Surrey as the company will still not sell that model there either. To add the same negative keyword to several campaign you need to use the shared negative keyword list in the shared library. There are some cases where you will want to add a search query as a negative keyword but it should only be for a single ad group. For example if you have a campaign that advertises doors and accessories for doors. You may want to add the word “door handle” as a negative keyword in the ad groups that are advertising doors, so that any searchers that contain this search are channeled into the ad groups for door handles. You don’t want to add the negative keyword door handles at campaign level because this term is still relevant to what you are advertising. However it is not relevant to the ads within the ad group. Your search query reports are a goldmine for finding new negative keyword opportunities and this is where you will find the vast majority of opportunities. The search query report shows you all of the searchers that users have typed into Google that have triggered your adverts to appear. There are several types of search query that will make good candidates for negative keywords. The first and most obvious one are search queries that are completely irrelevant that have been caused by using broad match or phrase match keywords. Chad Summerhill wrote a brilliant 4 part series for Wordstream that teaches you exactly how you can find these types of search query using excel and a few simple functions. You can read his articles here – Advanced search query mining part 1: The power of search queries. For more advanced users you will want to use something called n-gram analysis to find new negative keyword opportunities. This allows you to analyse the performance of individual words within the search query. So for example you may find that all of the searches that contain the word free convert very poorly and you may want to add this as a negative keyword. Here is a script that can run this analysis on your Adwords account for you and then will create a report within Google Sheets. You can then analyse this report to find new negative keyword opportunities. One of the quickest and easiest ways to find new negative keywords is to add pre made negative keyword list. When you are doing research to find new keywords it pays to also look for possible negative keyword opportunities. For example if you type into the search box calendars you will see a long list of related keywords along with some data on the average CPC and the amount of competition. Here you will see that there are several terms that would not be relevant if i was selling calendars, such as “free calendar template”, “free printable calendar”, “free calendars” and “printable calendars”. It makes sense to create a list of these irrelevant keywords as you go along and then to add them as negative keywords when you come to building your campaigns. Depending on what level you have decided to add your negative keywords at you will need to use slightly different strategies. If you want to add your negative keywords at account level then you will need to add them to the shared library however if you want to add them to campaign or ad group level you can add them using either the Adwords interface or Adwords editor. STEP 1. 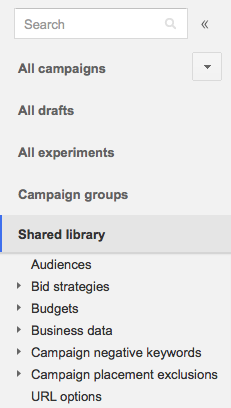 Navigate to the shared library, this can be found below your campings in the left hand side menu of Adwords as shown below. STEP 2. Scroll down until you see campaign negative keyword as shown below. STEP 5. You now have to apply the negative keyword list to the campings that you want it to apply too. If you want to apply it to all campings then select all of the campings. To do this select the list and then click the apply to campaign button. STEP 6. Now select which campings that you want your negative keywords to apply to by clicking the two arrows next to each campaign to move it into the selected campaign box. If you want to add all campaigns click the two arrows at the top in the header and this will apply your negative keywords to all of the campings within your account. Once you have done this click save. Adding negative keywords at campaign or ad group level. Adding negative keywords at campaign level or ad group level can be achieved using either the Adwords interface or by using the Adwords editor tool. I will cover how to do this using the Adwords interface below, however for more advanced users I would suggest reading “how to use Adwords editor to bulk upload” by Pitstop Media. STEP 2. Go to the keywords tab and then then select the negative keywords sub tab as shown below. STEP 3. Depending on what level you want to add your negative keywords, select either ad group level or campaign level and then click +keywords. STEP 4. Select a campaign and then enter your new negative keyword. Make sure that you specific the match type by using the following symbols. For exact match surround your keyword with square brackets [keyword] for phrase match surround your keyword with quotation marks “keyword” and for broad match leave the negative keyword as it is. Creating comprehensive lists of negative keywords is often overlooked by advertisers but is essential to irradiated wasted spend that eats away into your profits. By utilising the three key methods for generating lists of new negative keyword opportunities and paying careful attention to match type and the level at which you are adding your negative keywords at you should already be a long way ahead of your competition. If you have any questions about this article please feel free to comment below and I will do my best to answer them! Thanks for the share. 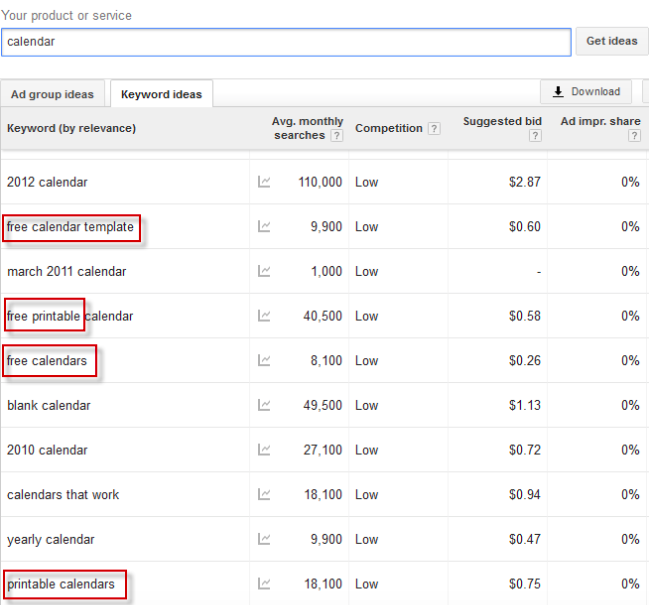 I think the mining of Google keyword planner is by far my favourite tip out of the entire bunch of tips. Thanks Wiehan, Its a simple one but not very well known!